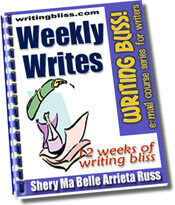 The Writing Bliss!™ Series consists of free and fee-based e-mail courses for writers. They're fun, creative, motivating and guaranteed to get you writing! Try one or all of them today! If this is your first time to visit this site, my suggestion is: don't sign up for more than 2 courses at a time! Why? Information overload. 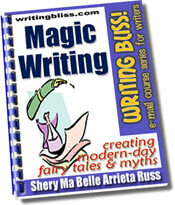 The Writing Bliss!™ course modules are designed to be hands-on. They aren't just for you to read. You will be writing each time you receive a module. Finish the 2 courses you signed up for first before signing up for more. The courses aren't going away. Weekly Writes: 12 Weeks of Writing Bliss! My book, The Journaling Life: 21 Types of Journals You Can Create to Express Yourself and Record Pieces of Your Life, is now available! Head on to TheJournalingLife.com for more info and to order (opens a new window). 10% off today. Bonus gift + FREE shipping anywhere in the US! Start journaling today! My book, The Authentic Self: Journaling Your Joys, Griefs and Everything in Between (ISBN 978-0-6151-5562-3, 212 pages, paperback), will get you started right away. You'll be journaling all the way through 2011 and beyond. Get your autographed copy of The Authentic Self at 10% off its retail price, 1 bonus gift and free shipping anywhere in the US. This course will be your journaling guide for 4 straight months! Every 3 days for four months, one Life Sketches module will be delivered straight to your inbox. The fee for this course is $20. If you are a US resident, sign up for another value-added course in addition to Life Sketches and you'll receive complimentary print copies of those 2 value-added courses by postal mail. For 31 straight days, the Guide Quotes modules will provide you with meaningful quotes you can apply to your life experiences plus texts and questions to help you come up with insightful journal entries. The fee for this course is $12. 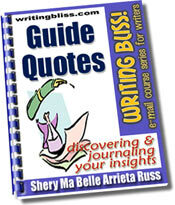 At the end of the course, you will receive a .PDF compilation of all 31 Guide Quotes modules as well as 150 more Guide Quotes questions to help you continue with your journaling. If you are a US resident, sign up for another value-added course in addition to Guide Quotes and you'll receive complimentary print copies of those 2 value-added courses by postal mail. LifeWrites features 6 approaches or writing techniques you can apply to journaling. 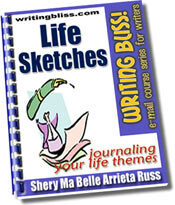 In 2 short weeks, you'll have 6 journal pieces to jumpstart your autobiography. 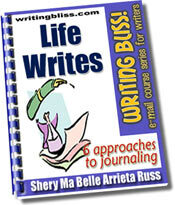 There is no registration fee, but writers may take the value-added version for $20 and receive the following at the end of the course: a .PDF compilation of all 6 modules (plus 4 more approaches), which includes detailed explanations, additional activities and exercises, a Memory Book template, and The A to Z Book About Me Journaling Guide. If you are a US resident, sign up for another value-added course in addition to LifeWrites and you'll receive complimentary print copies of those 2 value-added courses by postal mail. This course features 21 short but effective activities to jumpstart your creativity and writing. Every day for 3 weeks, 1 creative starter/activity will be sent. There is no registration fee to take the sampler version (7 modules, 1 week), but writers may take the value-added version for $12 (21 modules, 3 weeks) and receive a .PDF compilation of all 21 modules (plus 29 more creative starters). If you are a US resident, sign up for another value-added course in addition to Creativity Alley and you'll receive complimentary print copies of those 2 value-added courses by postal mail. Inner Journey will take you to an incredible journey within your self, while giving you an eagle's eye view of the world outside. Each module is a gentle push for you to think and feel more deeply; write more honestly. You'll look forward to spending those precious 15 minutes on creatively and purposefully nurturing the writer and person inside you every week. This course comes in 3 versions: Inner Journey Dip (free; 6 modules), Inner Journey Springboard ($12; 18 modules + 3 more) and Inner Journey Complete ($20; 36 modules + 16 more). If you are a US resident, sign up for Inner Journey Complete and you'll receive a complimentary print copy of this course by postal mail. 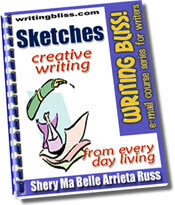 Sketches: Creative Writing from Every Day Living is a self-paced introductory e-mail workshop on creative writing using every day, ordinary experiences. This course consists of 10 modules. The course fee is $25 and you can begin the course anytime. Try out a module before you decide you want to take the complete course! Send an email to our autoresponder, sketches@writingbliss.com, and you'll instantly receive a sample module. If you are a US resident, sign up for another value-added course in addition to Sketches and you'll receive complimentary print copies of those 2 value-added courses by postal mail. Click here for the course outline and registration. This free e-mail course consists of 6 modules delivered on Monday, Wednesday and Friday for 2 weeks. It explores the 3 most commonly used figures of speech and includes activities and exercises on how writers can use them to come up with striking and textured creative pieces. There is no registration fee, but writers may take the value-added version for $12 and receive the following: a .PDF compilation of all 6 modules, which includes additional activities and exercises; a reference guide listing 100+ figures of speech with examples; and the WriteSparks!™ Imagery Kit software (this software is specifically created for this course and is not sold separately). If you are a US resident, sign up for another value-added course in addition to Words, Swallow Me and you'll receive complimentary print copies of those 2 value-added courses by postal mail. Every day for 31 days, you'll receive one Daily Write activity. If you've been on a writing slump, feel that you're blocked and can't write, or want to develop the habit of writing every day, Daily Writes is perfect for you. Daily Writes is a care/referral-ware e-mail course -- which means you get free access to the course when you refer 4 writers you know. Daily Writes was introduced on February 4, 2002. To date, more than 15,000 writers worldwide have taken it. Click here to register for Daily Writes (opens a new window). Weekly Writes features 12 modules containing bite-size writing activities and motivations for writers. Each module is delivered every Monday for 3 months. 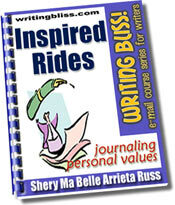 Weekly Writes is a spin-off of Daily Writes, our most popular e-mail course. Weekly Writes: 52 Weeks of Writing Bliss! is now available as a book. And you can get your copy from Amazon.com for only $11.95 (or less). But before you do, make sure you visit the Weekly Writes Book Official Site for details on how, as a Weekly Writes book owner, you can get 2 additional e-books that will nurture and encourage the writer in you... FREE! The Weekly Writes 12-module sampler course gives you a glimpse of what's in the book. Weekly Writes is free to graduates of Daily Writes (so sign up for Daily Writes and go through the 31 modules first) or buy the Daily Writes e-book (with bonus prompts not included in the e-mail course) for only $8.95 and begin Weekly Writes automatically. 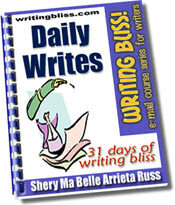 Click here to buy the Daily Writes e-book and begin Weekly Writes immediately. 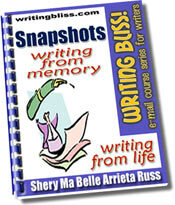 Snapshots: Writing from Memory, Writing from Life is a self-paced e-mail course on memoir writing, journaling and scrapbooking. This course consists of 14 modules. The course fee is $34.95 and you can begin the course anytime. Try out a module before you decide you want to take the complete course! Send an email to our autoresponder, snapshots@writingbliss.com, and you'll instantly receive a sample module. If you are a US resident, sign up for another value-added course in addition to Snapshots and you'll receive complimentary print copies of those 2 value-added courses by postal mail. Many writers have discovered that writing about their grief, loss or pain is therapeutic. So is writing about those joyful, memorable moments! In 3 short weeks, Joyful Writes will take you by the hand and guide you towards putting to paper your happiest moments. You're in for the greatest celebration of your life! If you are a US resident, sign up for another value-added course in addition to JoyfulWrites and you'll receive complimentary print copies of those 2 value-added courses by postal mail. In this course, 5 specific life themes will help you begin journaling your thoughts, emotions and memories right now. If you've always wanted to start a journal but don't know where to begin or what to write, this course is the perfect journaling jumpstarter for you. There is no registration fee in order to take this course. An e-mail course that will help you explore and journal your past and present feelings, because it is through facing your emotions that you discover your personal (emotional) truths. This course consists of 23 modules delivered for 23 consecutive days. There is no registration fee in order to take this course, but writers may take the value-added version for $12 and receive the following: a .PDF compilation of all 23 modules, which includes additional activities and exercises as well as a list of 100 more emotions to explore and journal about. If you are a US resident, sign up for another value-added course in addition to MemoryPrints and you'll receive complimentary print copies of those 2 value-added courses by postal mail. How do you perceive yourself as an individual and as a writer? Have you been building a false image of yourself unconsciously over the years? Are you doing things that silently undermine the writer inside you? In 2 short weeks, Inspired Change will help you discover simple and practical strategies and activities for re-building your self-image as a writer. The fee for this course is $12. This course will be available beginning January 2008, and will be free to writers who own the Weekly Writes book. In this course, you'll explore and journal your personal values. Inspired Rides will help you crystallize and write down in paper your values system and the things in life that are most important to you. There is no registration fee in order to take this course, but writers may take the value-added version for $12 and continue taking the course for 2 more weeks. They'll also receive the following: a .PDF compilation of all 9 modules, which includes additional activities and exercises as well as detailed explanations. If you are a US resident, sign up for another value-added course in addition to InspiredRides and you'll receive complimentary print copies of those 2 value-added courses by postal mail. Magic Writing takes you to a one-of-a-kind writing journey. You'll discover the wondrous magic that exists only in the world of fairy tales and myths. In 2 short weeks, you'll learn how to brew your own charmed, magical and creative fairy tales and myths. Look back and count your blessings last year. 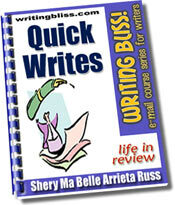 Sign up for our New Year QuickWrites e-mail course. Every day for 6 days, you'll receive a short prompt to help you review your life during the past year. This QuickWrites e-mail course is light and fun. Life in Review is the perfect "look-back-to-the-year-that-was" activity you can do alone or with your family. The lessons were great. It's so simple yet so perfect. Everything one already knows but [has] never cared to think about is put forward in a simple manner. I loved Daily Writes. It held me accoutable for journaling daily and now that habit is ingrained within me. Thanks so much for the daily prompts! I enjoyed the Daily Writes so much! The prompts were much better than any I've read in magazines. They really got me back in the habit of writing every day. Your thirty one days [of] writing bliss was to me 'the simplest heaven' every writer needs to 'sail free'. In fact, my [writing] voice became clearer after listening to yours. 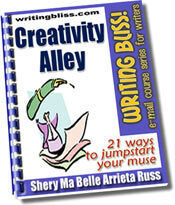 I loved the daily writes - Shery you are an inspiration and you sure know how to get the muse to wake up and take notice. I would continue to take daily writes until I can't write anymore. I saved every one to use again and again. I've never had so much fun writing before. I didn't know I could write creatively until I took Sketches. Thank you! Before I started Daily Writes, I had a constant feeling that my work was just not good enough and then I'd start and stop without finishing anything-let alone get to the middle. But now I'm oozing with confidence and my 3 minute gold mine is making it all [better]. I didn't realise what 3 minutes of just writing could do. I feel very motivated and stimulated right now, thanks to the daily exercises. I have started my writing and ideas seem endless! I would like to thank you for sending me for 31 days excellent prompts for writing and of course, prompts for understanding better one's self, leading to self-knowledge. I found the Daily Writes very inspiring. I enjoyed being taken within myself. I've been able to use this inspiration for story lines, poetry and even my journal writing. My compliments to you for creating a unique exploration into my writing capabilities. I found it to be challenging as well as educational but not formed into the boring text book atmosphere. Daily Writes was great...It was like having an angel on my shoulder whispering that it was okay to write, even if only for a few minutes a day, and that there were many others like myself out there. Daily Writes was great. It gave me the time to find inspiration I never thought existed. It also helped me explore the other areas of writing. I've just completed the Daily Writes and it was great! I would like to thank you for opening my eyes again...didn't make me feel all alone; knew that it was ok to falter and I'm picking up where I left off. I never thought I could write with such passion while undergoing this workshop. The course was very concise which was great as it allowed me to keep my mind active by doing a little creating writing each day. I have had tons of ideas from the Daily Writes and I wish to thank you for making it free. I enjoyed [Imagery in Writing] very much. It has increased my ability and comfort zone in addressing all the senses in my writing. I gained a lot of information from the [Imagery in Writing] series and would definitely recommend it to others. I really enjoyed the [Imagery in Writing] modules. They made me look at my writing from different perspectives. Your online course [Imagery in Writing] was just what I needed to shake the cobwebs from my deadline-frazzled brain. I was surprised at the creativity that resulted from the simple exercises. ...the Imagery in Writing course has been most valuable in helping me to write in a far more interesting and well thought-out way. I looked forward to each day and receiving my Daily Writes ideas/assignment. I loved it and it has enabled me to once again get back to letting my imagination/thoughts be transfered to paper. Daily Writes was very good. Being given something to write about every day inspired me to write more. As a result I have completed my first short story after a break of about twenty years. Before I signed up for [Daily Writes], I was in a lazy and discouraged mood. But when I started doing it, everything just clicked! I feel like I have rediscovered my writer self again! It was an amazing reunion! I was surprised by the quality of Daily Writes exercises. My expectations were low, knowing that they are free, so I was very happy to find them inspiring and extremely helpful. Start journaling with the help of Journal Sparks: 300 Questions to Journal About. We'll ship this print booklet to you...free!